Right across the street from the Parliament building in Athens there stands an outdoor café. Many times I have sat and sipped Ouzos at that cafe watching the changing of the guard as one stoic protector of the palace replaced another. They strut and stomp across the plaza then placidate themselves in front of those little wooden houses that look like they belong more in cartoons rather than standing as bastions of government. There are two guards. Each carries an unarmed rifle. They don’t protect anything of course; it’s a show, a demonstration of sorts. I wonder where they are now. Today the demonstrations are in the same place but they are of a different kind. There are fires on the plaza. Did they burn those silly little guard houses, I wonder. I do know, however, that the protesters burned the German flag. They didn’t burn the German flag because Germany contributed more funds than any other European nation to help Greece out. They burned the flag because Germany stopped. Feed a hungry bear and he will lick your hand. Stop and he will bite it off. 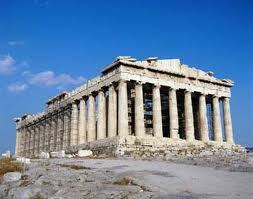 The root problem in Greece is not financial; it is cultural. If the Soviet Union was the triumph of Communism, then Greece is the triumph of Socialism. The country has a history of economic distress. In 1922 the government decreed that 50% of all privately held money in banks had to be given to the government. The national treasury gave bonds in exchange, to be repaid on 20 years with a nominal interest rate of 6 ½ %. Neither interest nor principle were ever paid. The people bailed the country out, involuntarily. It happened again in 1926, four years later another bailout. In 1932 the country declared a moratorium on their international debt. Bailed out again, this time by the international community, again involuntarily. Should the world do it again? For humanitarian reasons, perhaps we must, but for how long and how much. Philanthropy overdone eventually becomes license for continued misbehavior. It is Europe’s problem and Europe is doing its best to solve it. Germany enjoys the largest and strongest economy in Europe so the cross falls primarily on the German people to bear. We empathize. We have been there. This entry was posted in Economy, Opinion, Political philosophy and tagged Athens, bailout, European Union, Flag of Germany, Germany, Greece, Ouzo. Bookmark the permalink.